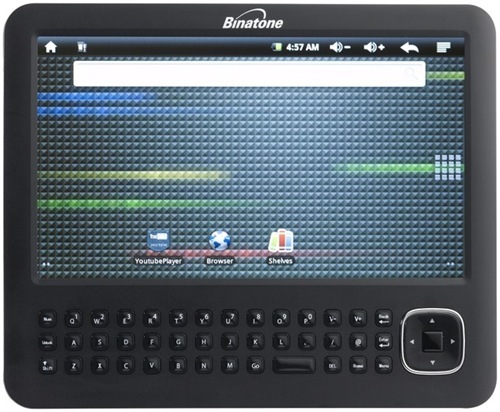 Binatone has launched Binatone ReadMe Mobile, a gadget which comes with a full QWERTY keypad and 7-inch screen. Binatone ReadMe sans touch screen, has WiFi and can playback music. It comes with 2GB internal storage and is powered by Android 2.1. Binatone ReadMe provides 6 hours of reading time. Binatone ReadMe is priced at 129 GBP which would come to Rs. 9200. LetsBuy is selling it for Rs. 6699. That’s cheap but not a compelling reason to buy. And don’t let that stand at the back fool you. Binatone ReadMe Mobile is the mongrel of gadgets. 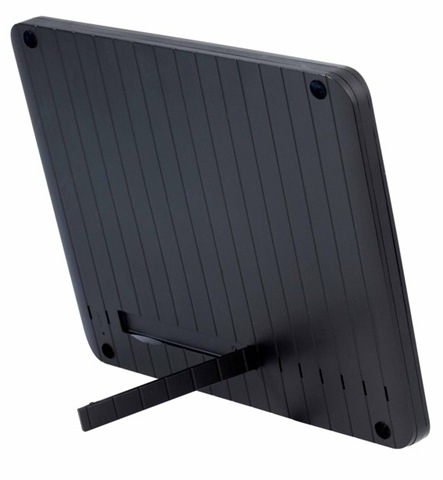 It could be easily mistaken for a tablet because it has a 7 inch screen, runs Android and has the looks of a tablet. Or it could be easily mistaken for an eReader because it doesn’t have a touch screen, it has a full QWERTY keyboard. The problem is, it neither is a eReader (no eInk) nor a tablet (no touchscreen). It falls somewhere in between. If Asus Transformer took the best of a tablet and a netbook, Binatone ReadMe took the worst of a tablet and a eReader. And don’t even get me started on the name. ReadMe Mobile? What were they thinking? Drop the ‘Mobile”. It’s cleaner that way. If you are not Apple, don’t launch cross breed products and try to create new markets. Amazon which brought the eReaders to vogue with its Kindle is rumored to be moving towards a touch screen eReader. Barnes and Noble’s Nook is one of the successful eReader’s out there and guess what? It has touch screen too. In today’s world, a non-touch screen device is a pariah. When every manufacturer is showing great enthusiasm to launch touch screen devices, Binatone has taken the contrarian approach. Well, this is no stock market for contrarian approaches. Getting back to question, what do you think Binatone ReadMe Mobile is?